This entry was posted in Community, Research and tagged ACES, Alabama Cooperative Extenstion System, Insect, Kudzu on July 22, 2013 by Wire Eagle. 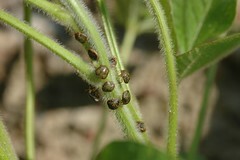 AUBURN UNIVERSITY – Alabama Extension specialist and Auburn University professor Xing Ping Hu is gaining insight into the virulent kudzu bug, including the discovery of a native predator that could go a long way toward reducing the pest’s numbers. “Since its detection in 2009, this stink bug has developed from an urban nuisance to a serious bean crop pest throughout the Southeast,” said Hu, an Alabama Cooperative Extension System entomologist and professor in the Department of Entomology and Plant Pathology. She added that its rapidly expanding range, explosive population growth, severe damage to legume crops and vegetables, repulsive smell and difficulty to control have contributed to its elevated pest status. This entry was posted in Community, General News and tagged ACES, agriculture, Alabama Cooperative Extenstion System, forestry on June 24, 2013 by Wire Eagle. AUBURN UNIVERSITY – A newly released series of reports demonstrates the dominant and, in many cases, indispensable role the agriculture and forestry sector plays in the economic fortunes of Alabama’s 67 counties. The reports, collectively titled the Economic Impacts of Alabama’s Agriculture, Forestry and Related Industries, are the result of a collaborative effort of the Alabama Agribusiness Council, the Alabama Cooperative Extension System, Auburn University and other businesses and organizations. It is a compilation of agricultural and forestry economic data collected from all of Alabama’s 67 counties. The comprehensive county-level data is available online: http://www.AlabamaAgImpact.com. This entry was posted in Faculty, General News and tagged Alabama Cooperative Extenstion System, Fertilizer on April 26, 2013 by Wire Eagle. AUBURN UNIVERSITY – A professor at Auburn University says the likelihood of a fertilizer-related incident similar to the fiery West, Texas, fertilizer plant explosion that killed 14 people and injured some 200 others is extremely remote in Alabama. That is because the two products that have been linked to the blast are either not used in Alabama or are extremely rare. Anhydrous ammonia and ammonium nitrate are the two substances that have been investigated as possible causes of the April 17 explosion of the West Fertilizer plant.